The latest direct to DVD animated film from Disney arrives with Tinker Bell and the Great Fairy Rescue and revolves around one their cutest and most appealing franchises to girls, Tinker Bell! Starring Mae Whitman, Michael Sheen and Pamela Adlon, these actors really get into their characters and bring them to life which makes the story so appealing. The story revolves around Tinker Bell (Mae Whitman) and her friends who must rescue fairy Vidia (Pamela Adlon) from the nefarious clutches of Dr. Griffiths who was attempting to catch Tinker Bell in order to divulge their secret to the world that fairies actually exist. Joining together and forming some uneasy yet amusing alliances, Tinker Bell risks herself in order to free her friendly nemesis Vidia as they go on a whirl wind journey that features action, humour and a rather cliché less story which is quite surprising from this genre. There are some great scenes in this story, especially the relationship between Tinker Bell and Lizzy with Tinker posing as a somewhat mentor to her in order to help her grow. Best of all, the story can be watched by children of all ages and there are not too many frights along the away, although maybe a few little scares but nothing too frightening. All in all, a fun and memorable story. Presented in 16:9 widescreen, the animation looks amazing on a FULL HD TV with vibrant colours, extremely well animated characters and some beautiful environments that have been created for this film. Even though it doesn’t have the budget of movie releases, the creators should be commended in not cutting any corners and releasing a well made animated film. The audio supports Dolby Digital 5.1 and boasts crystal clear audio, a great soundtrack and good use of surround sound, especially a few of the chase scenes. For special features, there is an interesting featurette by the director and producer as they inform the viewers of a variety of deleted scenes which were cut from the final film. This is an interesting insight into the movie making industry and is definitely quite a light hearted feature. Add a variety of games, a music video “How to Believe” and lastly a featurette to tug on your emotions about Tinker Bell and these nicely compliment the film. 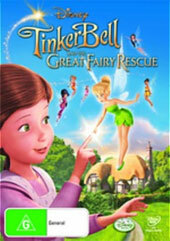 If your daughter loves Tinker Bell or you’re looking for something to keep them occupied over the holidays, you should definitely investigate Tinker Bell and the Great Fairy Rescue! It’s a fun film from start to finish and is quite interesting that Peter Pan’s sidekick has become more popular than the flying boy!